So we went to see Avatar today. I am not even going to go into a review about the movie because...well...lets be honest, is their any doubt that, after all my nerdy confessions of Sci-Fi love, I could possibly not adore this movie? I loved it. LOVED IT. Moving on. The point of the post is not that I saw the movie, but that I saw the movie...in THREE DEEE. (I spelled it out like that for infuses. Please read it in the James Earl Jones voice). So, just for a little back story for fun, when my dad said we were seeing it in THREE DEEE I was all like, "Awesome" and then someone said something about the glasses and I was all like, "hold up. We have to wear GLASSES?" and seriously Nick did the slow head turn look of shock and said "Um, YEAH. How did you think we could see it in THREE DEEE without glasses?!" And I said something like, "Well...I figured a special screen came down or something.." and he rolled his eyes at me as if to say I was a fool. I though the special screen was pretty good considering what I HONESTLY thought was that they made magical 3D film. I mean, everyone sits in all these 3D movies in GLASSES?!?! It's 2010 people. It's high time to find a way. Pretty cool, right? They are totally just glasses! Way better than trying to keep cardboard behind my ears for three hours. I am pretty sure they actually brought Edward Cullen in to help design them and everything. Come to think of it, I think they should actually advertise that point a lot more. People might go to THREE DEEE movies a lot more often if they knew they would come out looking like Edward. 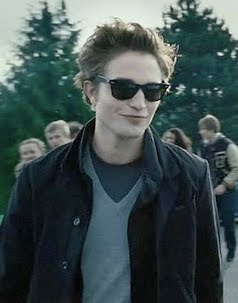 *picture of Edward Cullen included...just to prove the glasses are basically identical. Although he may pull them off better than me. But come on. He's a vampire. Ooh I loved reading over your "best-of" post, very good to reminisce! And this post made me laugh... we went to see Disney's "UP" in 3D and I was so impressed with the glasses (we were supposed to leave them at the cinema to be "recycled" but we stole them, much to the disapproval of our 10 year old niece hehe. They are indeed very cool, although your idea of a screen makes much sense, especially as Tim struggled a bit more than me by having to put the 3D specs over his own glasses! Glad you enjoyed the film, I think Tim and I need to go watch it too! Funny post! I like your emphasis on THREEE DEEE!! And I thought they still used blue/red cardboard glasses too! We saw Valentine's Massacre in 3D too, and were amazed when they handed us those glasses LOL.